(Nanowerk News) Peng Zhang is excited about gold, and you should be too. In particular, he’s excited about nanogold, structures of a handful of atoms measuring only a few nanometers in diameter. Zhang, a researcher at Dalhousie University, and Canadian Light Source synchrotron user, has a unique understanding of the potential nanogolds have in biomedicine and beyond. It’s also incredibly stable. It doesn’t rust, since its oxidized or rusted form is less stable than unadulterated gold. Decaying bridge joints and the green Lady Liberty speak to just how rare a stable metal is. Combining those two properties in biomedicine means that you could use gold without worrying about the treatment losing its effectiveness or hurting the patient. Zhang’s team believes nanogold could be a good fit as a catalyzing agent, something that speeds up other reactions without getting used up itself. Due to the extremely small size of nanogolds, they were recently found to be efficient catalysts for converting toxic gases into nontoxic ones. Plus, nanogold’s incredible stability gives it an advantage over other metal-based catalysts, which tend to have shorter lifetimes. In order to harness nanogold’s potential, researchers have to make sense of its structures and behaviours, which are in many ways completely different from those of typical chunks of gold. Which brings up another way in which gold is unique: you can’t use the same techniques you would to study it as you would other common elements like carbon or nitrogen. Instead, researchers rely on X-ray based spectroscopy, specifically XAS (X-ray Absorption Spectroscopy) and XPS (X-ray Photoelectron Spectroscopy), techniques available on several CLS beamlines and its partner beamlines in the U.S.
Zhang has been using the CLS for his research since he was a student himself, under founding CLS researcher TK Sham. Since then, the facility has become a go-to for him both for the relationships he’s built and the excellence of its available techniques. “When we need low energy X-rays we always come to the CLS. The Canadian synchrotron is particularly good in low energy X-ray techniques,” Zhang explained. Using these synchrotron techniques, Zhang’s research team is able to finely model the electronic structure of the nanoclusters, noting variations in structure and properties of the clusters caused by shifts of one or two atoms ("X-ray Spectroscopy of Gold–Thiolate Nanoclusters"). That such minuscule variations actually caused changes in the electronic behaviour of gold was something of a surprise. For one thing, researchers have only recently been able to reliably produce gold nanoclusters with specific numbers of atoms, making specific observations infuriatingly hard to come by. For another, most nanotechnology applications would treat variations of a couple of atoms in a cluster as a negligible variance. Not so for gold clusters with a few tens of atoms. A cluster of 36 gold atoms has a completely different structure than a cluster of 38 atoms, with vastly different electron densities, making each appropriate for different types of catalytic reactions. “It was a very big surprise to us, and it’s useful, because if you tailor the composition, you can very efficiently control the properties,” Zhang said. 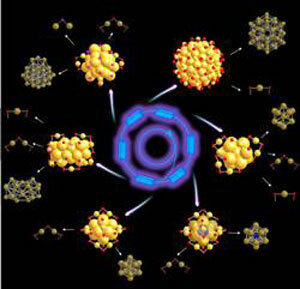 Only by harnessing new techniques to produce incredibly uniform samples of single-size gold clusters and observing their individual properties and structures was Zhang’s lab able to start cataloguing the variety of properties of this nano wonder. In this regard, Zhang’s collaborators, such as Rongchao Jin from Carnegie Mellon University, can achieve higher than 99% purity for the gold clusters. As the team continues to explore how they can tailor and refine gold nano structures, they’re also looking into ways to harness other noble metals in combination with gold. Silver and platinum, both valuable metals and with interesting medical and catalytic potential in their own right, could reveal new potential using the analytic techniques used by Zhang’s team. Next up, Zhang plans to look into gold and metal composites, to understand how these structures work. The team also remains committed to examining potential biomedical applications for their work, in collaboration with biomedical researchers from Dalhousie University and Halifax Infirmary Hospital.